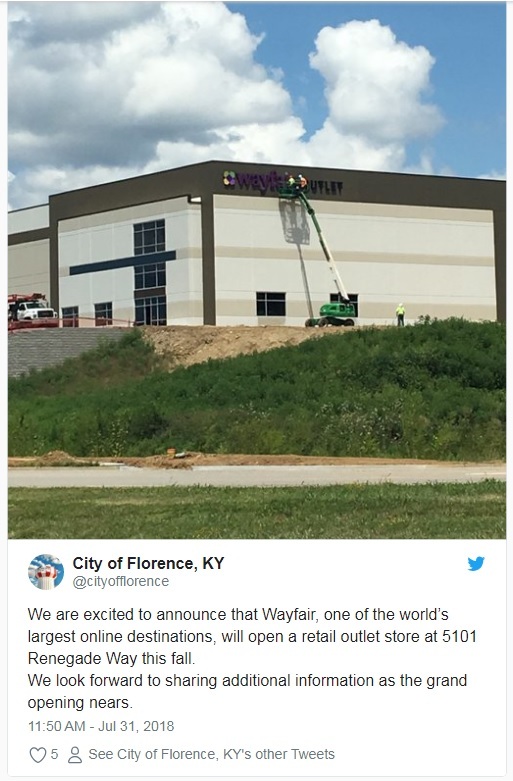 FLORENCE, Ky. — Wayfair plans to open a retail outlet here early next year, the e-commerce giant confirmed. It would be the first and, possibly, only brick-and-mortar location for the online pure-play giant that has pointed out online and in advertising that it has no stores, noting the efficiency and convenience of its e-commerce model. The 20,000-square-foot Wayfair outlet will be located at 5101 Renegade Way. A spokesman for the Boston-based e-tailer said it will sell returns and closeouts in good condition. "We have no other brick & mortar plans to share at this time," he said in an email. Wayfair, which already operates a distribution center in Erlanger, Ky., in the greater Cincinnati market, would be taking the bulk of a 260,000-square-foot distribution center under construction, carving out 20,000 square feet for retail, said Josh Hunt, Florence’s business and community development director. The city tweeted the outlet news Tuesday with a photo of the sign going up on a corner of the building. Wayfair later corrected the opening date, noting it will open by early next year, not this fall, as the city had Tweeted.